Gruppe’ Gallery, 22 Barber Pond Road, Jerhico, Vermont. 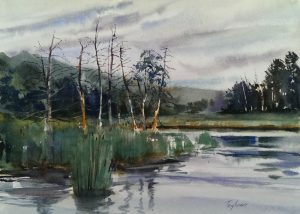 This exhibit includes seventeen recent en plein air landscape paintings depicting the Vermont landscape in various seasons. Like most of my en plein air paintings, these are focused on capturing a sense of time and place. My senses are particularly in tune with time as it passes through the cycle of seasons…Times of transition…are especially captivating and I work hard to capture the subtleties of a particular moment in each of my en plein air paintngs. Underhill Swamp (right), was done during the Jericho Plein Air Festival on July 16, 2016. The morning was quite overcast so there was little in the way of light and shadow to work with. 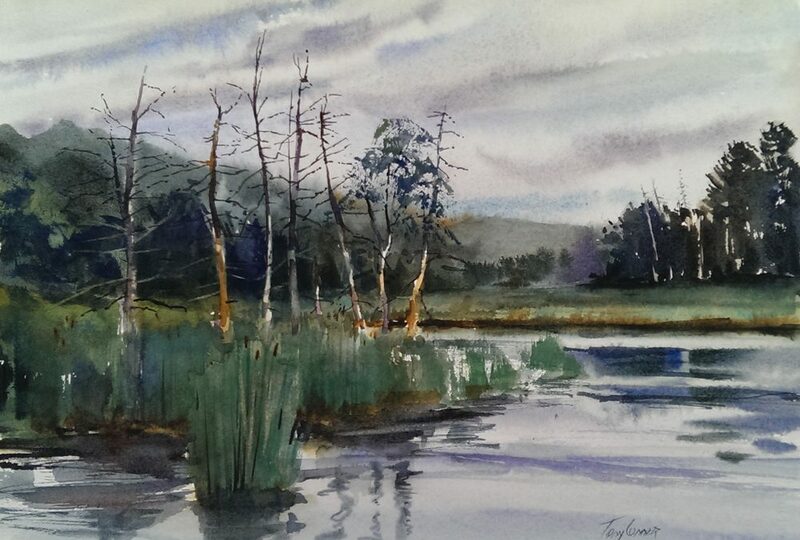 On overcast days, I often look for water, since the reflections of the sky help light up the painting. “Beyond the swamp water, there were a couple of other things that attracted me to this scene. There was a great sense of distance and the ‘aerial perspective’ would challenge my ability to mix the variety of greens needed to express the distance and keep the painting from being to monotonously green. The forlorn tree, desperately hanging on to its foliage in the midst of a group of already dead ones, also made the scene compelling. The exhibit includes seventeen paintings and is on exhibit through October 8, 2017. Opening Reception is Saturday, September 2, 2017 from 1 to 4pm.